Being confident make one's self more reassured. Briefly, explanations below are for two sided confidence levels/intervals in order to simplify the idea. Saying "two sided" gives initial impression that there is something like two limits, yeah they are: upper and lower limits where the confidence interval lies in between. Example: Let's look at the population of a specific mobile phone model. Suppose we are now interested in the 'weight' property. We found that weight property follows a normal distribution with mean value of 120 grams and a standard deviation of 1.4 grams. This understanding means that majority of mobiles tested will weigh very closely to 120 grams. Yes, there should be fluctuations above and below the mean value but surely that still relatively close to mean value. Suppose a question: do you expect weights like: 121, 119.5, 122.1, 118.9? Answer: Yes, I surely expect such values. Another question: do you expect weights like: 158, 67, 140.8, 82.5? Answer: No! This seems impossible. For any normal distribution, values goes to + and - infinity. But, as we seen, it has no sense to consider those values away from the mean value as they mostly will not occur (in statistics we say they have extremely low probability). Here it comes: confidence level means we consider only those values (within the confidence interval) that will mostly be seen. The most popular confidence level is 95% which means we focus on 95% of possible data/values. Far values away from mean value mostly will not be seen, thus we sacrificed by them (5% of data). The 5% is usually called as alpha which means the percentage of sacrificed data due to being so far of mean value. 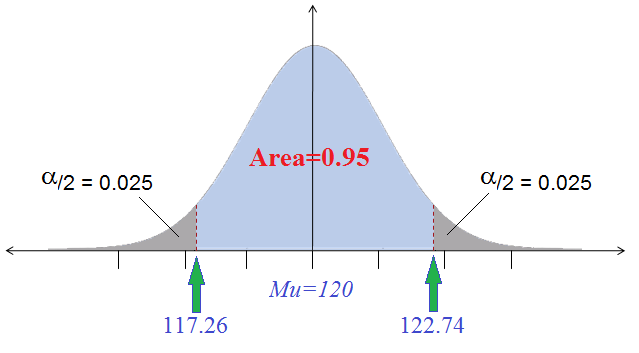 When having two sided confidence interval, alpha is divided into to halves (0.025 each): upper and lower, which is logical to represent upper and lower far values. For example above, simple calculations lead to find the 95% confidence interval which is [117.26, 122.74] defining [lower, upper] limits respectively. This result simply means that 95% of mobiles will be found to weigh between 117.26 and 122.74 grams. Note: the confidence interval depends on the population variance or standard deviation. Larger variance means wider confidence interval and vice versa.